MOJO introduces the TOTALLY NEW Mojo Teal with SUPER FAST WINGS - a whole new concept in duck hunting! 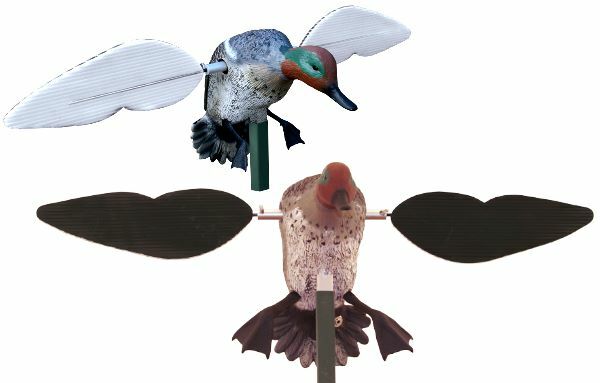 Experience has shown that mallards, gadwall, teal, pintails, divers, and all other ducks are much more attracted to a faster strobe effect of a spinning wing decoy. The MOJO Teal is a realistic looking green wing drake with wings that turn up to twice as fast as the typical spinning wing decoy on the market today. The MOJO Teal comes with a 3 piece support pole and features the famous MOJO Direct Drive System that can run for up to 16 hours on 4 AA batteries (batteries not included). Note: MOJO Teal is not remote capable.